Al Rashid Mosque ca. 1940. Image courtesy of the City of Edmonton Archives A98-55. How did a mosque come to be in Fort Edmonton Park? Where did it come from? Why does it look a bit like an Orthodox church? 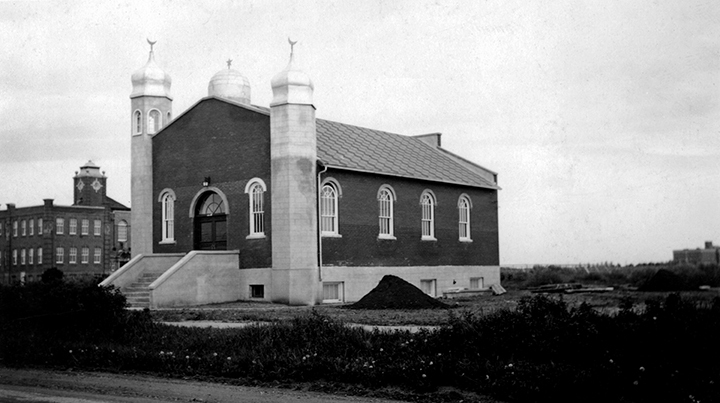 Opened in 1938, the Al-Rashid Mosque was the first mosque to be built in Canada. It was built by Edmonton’s Muslim community as a place to practice their faith and to teach their children. While the mosque was a place of worship, it was also used for social gatherings and other cultural events that were open to non-Muslims, creating a public space that brought a range of people from various religious backgrounds together. The community faced challenges in funding and building the mosque. Then, when it was replaced with a larger facility, preserving it and moving it to Fort Edmonton Park proved challenging as well. Some did not consider it an important part of Edmonton’s history. Members of the community, specifically the Canadian Council of Muslim Women (CCMW), overcame each obstacle. The Muslim community was established in Canada in the late 1800s when people began to immigrate in search of a better life. Muslims came from what is now Lebanon and Syria, which were part of the Turkish Empire at the time of emigration; they practiced their religion as much as possible in Canada, but did not have a mosque to worship in. They arrived in Eastern Canada and some travelled west, selling small goods such as clothing, pins, and beads to different communities across the provinces first as peddlers then later as storekeepers. As the Muslim community grew, some women made plans to open a mosque where the children could learn their religion and the community could host social functions. Thus, the Al-Rashid Mosque was born. Members of Al-Rashid Mosque celebrated Feast of Abraham’s Sacrifice, led by Shah Maulana Mohammed Abdul Aleem Siddiqui Al-Qaderi September 22, 1950. Image courtesy of the City of Edmonton Archives EA-600-5033a. One courageous woman, Hilwi Hamdon, approached Edmonton’s Mayor, John Fry, in the hope that he would supply them with land on which to build the Mosque. He responded by stating that the community did not have the money to build a mosque. Hamdon answered, “We’ll get the money.” The Mayor agreed to grant them the land if they supplied the money to cover the cost of construction, approximately $5,000. The group sought donations from Muslims, Christians, and Jews; they walked down Jasper Avenue asking each shop owner for donations and eventually raised enough funds. The community hired a Ukrainian-Canadian builder, Mike Drewoth; his blueprint for the mosque included one main room, lofty arched windows, two small rooms intended for ablutions, and an insulated basement for social gatherings. On the outside, two hexagonal minarets would be topped with an onion-shaped silver dome and a crescent moon. The mosque resembled a Russian Orthodox Church. The Al-Rashid Mosque was officially opened on December 12, 1938 on the corner of 101st Street and 108th Avenue. It stood there until 1946 when the Edmonton Public School Board asked the Muslim community to relocate so Victoria Composite High School could expand. Community members politely obliged on the condition that they were provided an alternative piece of land for the mosque. In November of 1946, the Al-Rashid was relocated to 102nd Street and 111th Avenue. The number of Muslims in Edmonton grew; by 1975, the Al-Rashid was too small to accommodate them and the community decided to build a new mosque. The Al-Rashid was left unused for nearly 10 years. In 1988, the Royal Alexandra Hospital told the community that the mosque needed to be moved within eight months or it would be demolished at the congregation’s expense. Naturally, the Muslim community regarded the mosque as a vital part of its heritage and did not want to see it taken down, so the Canadian Council of Muslim Women (CCMW) was formed to relocate the mosque to Fort Edmonton Park. They met with a great deal of opposition from Edmonton City Council, the city’s Parks and Recreation department, and Fort Edmonton Park. Mosque located on 111th Avenue May 01, 1976. Image courtesy of the City of Edmonton Archives EA-207-57. When the CCMW first approached the Parks and Recreation department, they were told that the Al-Rashid was not a significant part of Edmonton’s history and therefore it did not belong in the Park; however, they were provided with the opportunity to appeal this decision to City Council. The story of the mosque being placed in Fort Edmonton Park as a historical building spread throughout the city; it was displayed in newspaper headlines and discussed on talk show radio channels. Some people and organizations were opposed to the move, including The Edmonton Sun, unaware of the history of the mosque and of the Muslim community in Edmonton, but the Edmonton Journal examined the information provided by the CCMW and wrote an article explaining that the mosque did in fact belong in Fort Edmonton Park. Minds began to change. After a citywide debate, Fort Edmonton Park agreed to take the mosque under the condition that the Muslim community raise the funds to relocate and restore it. A fundraising benefit raised close to $40,000 in one evening. Shaylene Flanagan recently graduated from MacEwan University with a degree in Professional Communications. and Carolee Pollock teaches history at MacEwan University. She was born and raised in Edmonton. She has been involved in organizing the Edmonton Regional Heritage School Fair for several years.